The EU plans to make private lenders cover the losses of any future eurozone debt crisis, the BBC has learned. The decision may significantly raise the future cost of borrowing for over-indebted eurozone governments. It is part of a new permanent scheme - to be funded by eurozone governments, but not the UK - to replace existing bail-out funds that expire in 2013. The new mechanism will need a treaty change, which may lead to ratification problems in the Irish Republic. The details of the proposed European Stability Mechanism are included in a draft European Union communique obtained by the BBC. The changes come too late for the Republic of Ireland, which was forced by European partners to foot the bill for rescuing its banks in order to get an 85bn euro bail-out. In future, Brussels may require a crisis-stricken eurozone government to force losses on its existing private lenders - including investors in government bonds - before it would provide a bail-out package. The creation of the European Stability Mechanism in 2013 will formally collapse one of the founding principles of the single currency, ie the "no bail-out" clause. Rescuing ailing economies will now be enshrined in law through what the draft communique describes as "limited treaty change". This change may prove to be a headache for some EU member states, especially Britain, whose prime minister vowed to call a referendum if any new powers were to be ceded to Brussels. It will also be a major issue for the Irish Republic, whose constitution demands that any EU treaty changes get the blessing of the entire electorate. Many Irish people are livid at the high rate of interest (5.83%) demanded from their European partners as part of their 85bn euro bail-out and may exact bitter revenge in a referendum. And if a government got into trouble later down the line, it would be required to default on its other debts, while continuing to make payments on its rescue loans. "That won't please the markets, who thought that holding government bonds was as safe as cash deposits," says BBC business correspondent Joe Lynam. From June 2013, government bonds will also have to include "collective action clauses", which would make it much easier for an insolvent government to get the consent of its lenders to any future debt write-offs. Together, the changes mean a government's private-sector lenders will face a much bigger risk of losing their money. And this means they are likely to charge the more heavily indebted eurozone member states a higher interest rate. The rhetoric in the communique comes in stark contrast to the actual bail-out of the Irish Republic in November. In that rescue, Brussels is accused of having insisted that Dublin honour in full its guarantee of the Irish banks. 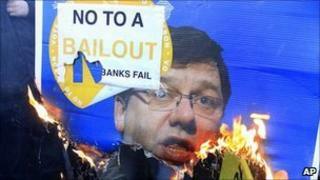 Many Irish are angry that this has landed taxpayers with the bill for repaying loans made to its insolvent banks. However, with European banks dangerously undercapitalised, European leaders feared that a default by the Irish banks could trigger a Europe-wide banking crisis. Separately, the EU is planning to carry out a new, and much stricter, set of stress tests on its big banks this year. The tests will determine how much capital the banks need to absorb future losses. The previous stress tests, held over the summer, were criticised for failing to consider the possibility of a default by a eurozone government. The planned Lisbon Treaty amendment is short and open-ended, leaving European leaders flexibility to structure the new arrangement however they choose. It states only that: "The Member States whose currency is the euro may establish a stability mechanism to safeguard the stability of the euro area as a whole. The granting of financial assistance under the mechanism will be made subject to strict conditionality." The amendment may also open the way towards a common eurozone government bond at a later date. This was a solution to the eurozone debt crisis proposed by Luxembourg Prime Minister Jean-Claude Juncker and Italian Finance Minister Giulio Tremonti, but rejected by Germany. Ratification of the treaty change may prove a challenge in some countries. The Irish Republic's constitution requires a referendum at a time when the public is angry with Europe over the harsh terms of their bail-out. In the UK, the amendment is not expected to trigger a referendum. The draft communique states that EU members outside the eurozone - such as the UK - may choose to participate in the new bail-out arrangement "on an ad hoc basis". However, right-wing members of his Conservative party may demand that Prime Minister David Cameron use the opportunity to negotiate UK opt-outs from existing treaty requirements. The communique also said that the EU will endorse making Montenegro an official candidate to join the European Union, meaning the country can begin formal accession negotiations.